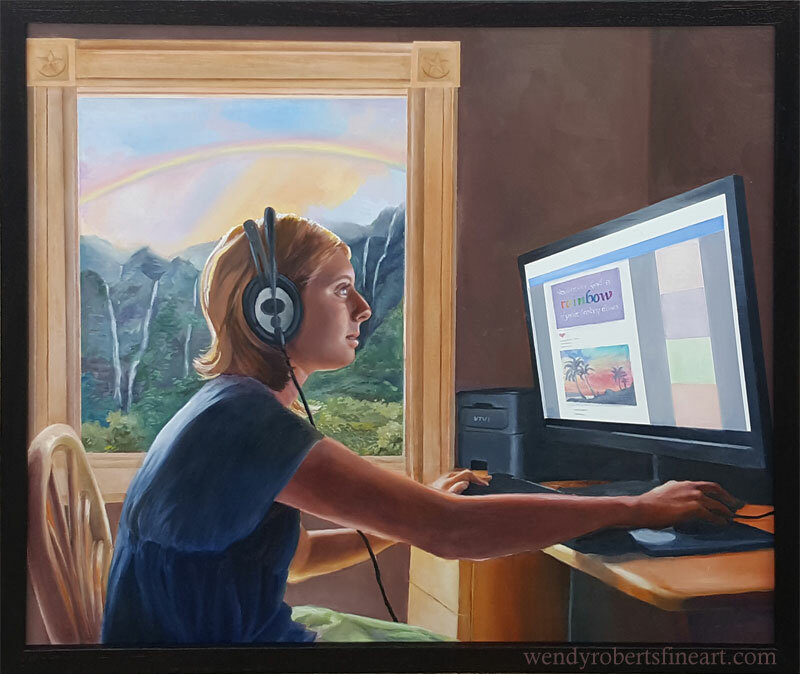 Wendy Roberts is inspired by the gorgeous Hawaiian islands. 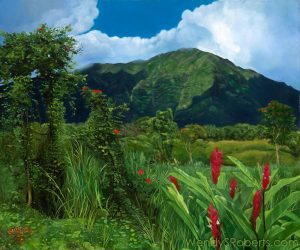 The stunning mountains, beaches, wildlife, and underwater world serve as the inspiration for her award-winning oil paintings, many of which depict the paradise within paradise: the wild beauty of Hawaii’s green natural spaces which enchant residents and visitors alike. Art history also serves a useful role as inspiration. Works involving elements of gold or silver gilding consistently caught her eye in museums. Eventually, she decided to incorporate elements of metal leafing (thin sheets of metal) into many of her paintings, but in her own way. The combination of tropical paintings with metal leafing worked into the composition, or “Tropical Leafing” is something unique she likes to create. The shimmer of gold or silver can add an element of ever-changing light to a painting. The paintings of natural subjects are a celebration of the beautiful world that surrounds us, and a reminder that we must protect our wild open spaces in order to connect with our deepest spiritual selves. Wendy also paints a second genre very different from the works described above. These are scenes meant to tell a story or express a concept that works on multiple levels. They usually involve people and have many symbolic elements within them. Recently, she has been thinking a lot about the impact of technology on society, and she feels this will be a continuing theme in her work, alternating back and forth from the natural to the technical. She strives to share creativity and insight within both realms of interest, reflecting on the circumstances of the modern human within both the digital and natural worlds; connected, surrounded, and dependent on both. Both genres of her work have been received well, garnering awards in juried competitions. Receive a newsletter approximately 6 - 8 times per year featuring glimpses into the studio, upcoming shows, and event announcements. There's also an option to receive each new blog post delivered to your inbox to save you from having to check the site for updates.